Burning Moon's Inside advice: Luv & Emma's Dry Pets Review & Giveaway! Luv & Emma's Dry Pets Review & Giveaway! Ferrets can be pretty messy and our male Starlord seems to be a dirt magnet so we give them baths every few days, since they are pretty small and their fur can hold a lot of water we like to make sure they are completely dry when they get out of the tub. When you are trying to wrangle to ferrets into towels it can be a little bit of a pain without any help but the new towel we received from Luv & Emma's helps make things a bit easier because their pet towels have a hole in them so you can hang it on a door knob to make reaching them easier. I have a closet right next to where the bath tub is so it is nice to have this towel hanging right where I can reach it and still keep an eye on the ferrets. This pet towel comes in two sizes, the Luv & Emma's Dry Pets which is 21"x17" and the Luv & Emma's Dry Pets Plus which is 36"x26". The larger size has a door handle hole on each side so that you can double it up and not have the towel dragging on the floor. 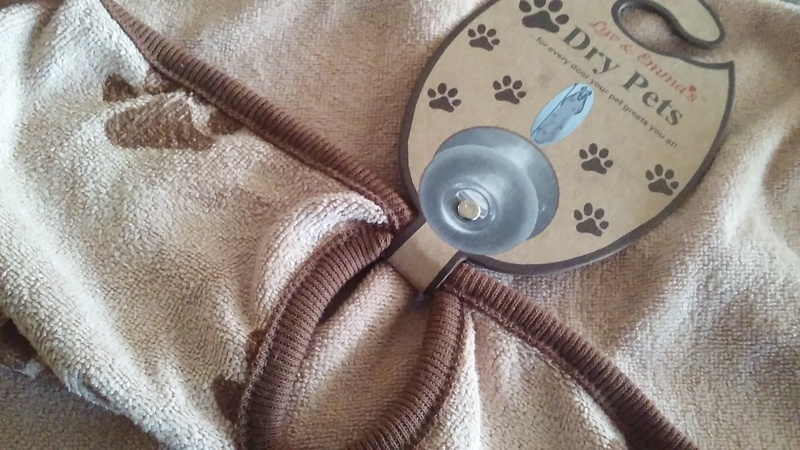 The handle hole makes this easy to use in the bathroom or to keep next to your backdoor so you can dry your pets off as they are coming into the house. They use an absorbent microfiber fabric to create their towels and it really does help dry the ferrets off faster than the regular bath towel we were using before and the ferrets seem more comfortable in this towel, it is the perfect size to wrap them up into a little bundle to dry them off with. The towel is machine washable which will make it easy to clean and dry for reusing again. The original cost $12.95 + Shipping and the plus is $15.95 + shipping. This product is great for dogs, ferrets, etc. One lucky reader is going to win their own Luv & Emma's Dry Pets 21"x17" towel. This is open to US Residents only! Please remember if you DO NOT leave a comment on this blog post as your mandatory entry into the giveaway then all of your entries will be void. Doing the Daily entries will increase your chance of winning. Winners have 72 hours to respond to the notification email! Giveaway winners are announced on FACEBOOK, If you would like to see who won my latest giveaways please visit and like my facebook page. Giveaway entry question: What type of pet do you have? 2 dogs 2 cats all awesome! We have 6 dogs, 2 cats and a lot of assorted reptiles. Dog. Hopefully getting chickens, ducks, and turkeys soon! I have a cute chihuahua! I have 2 pug's that go out for a few walks a day and a cat that stays indoors. I have a dog with hair long enough to drag on the ground. I use a drying towel daily. We have 1 dog, 4 cats and a guinea pig. They are all part of our family too, they are all spoiled rotten! I have 3 dogs... Westie, Border Collie and Australian Shepard. Hello & Welcome to my blog, My blog is open Internationally. My Nickname is Luna,I am a Mother to a Gorgeous little girl born on 12/2008 and a Handsome little boy born on 01/2013,I am currently engaged to my wonderful SO the father of my children,and we have one dog, I am a Blogger, Mommy & crafter. I reside in Sunny Arizona where i grew up, I love spending time with my family,crafting,reading, & I love blogging. Being able to show others great new products,sharing tips on savings,& hosting giveaways makes me happy it started as a hobby but now I consider it a part time job along side taking care of my family. Sleeping Baby Giveaway & Review! Alight Plus Size Clothing Giveaway & Review! Midnight Scoop Giveaway & Review!